I just spent wonderful weekend in Seattle with my fiber friends. It was the second finishing weekend of the year, a time when we dig out WIPs that have been languishing and dig in to get them done, along with a lot of catching up and some fabulous food. Finding knitting projects was a little difficult for me as the last finishing weekend took care of most of mine that needed just a bit of seaming or ends sewn in. Plus I frogged so many of my knitting WIPs. Quilting WIPs weren’t going to work as I didn’t want to haul my machine and all the necessary bulky quilting supplies. But I did have my blue sweater that just needed one sleeve sewn on, and my Volt wrap. And there were some embroidery projects to sort through for possible finishing contenders, and spinning fiber in progress. So in the end I had plenty to do. Enough that it took several trips to get all the bags and bundles out to the car. It was such a great time! So much laughing and helping and exchanging projects and sharing ideas and accomplishments. Portland Leslie likes to seam, and Seattle Leslie and I needed a lot of that. Paige loves to sew in ends (so weird! so handy!) and I was useful with machine binding. Have you heard of Slow TV? I hadn’t – apparently on Netflix there are hours and hours of Norwegian television that takes a topic and sticks with it through every possible second. There are eleven hour celebratory hours of a boat traveling a Norwegian canal. Eight hours of knitting talk. An entire multi-hour train trip captured on film. And our personal favorite for weekend viewing, five or six hours about wood chopping. 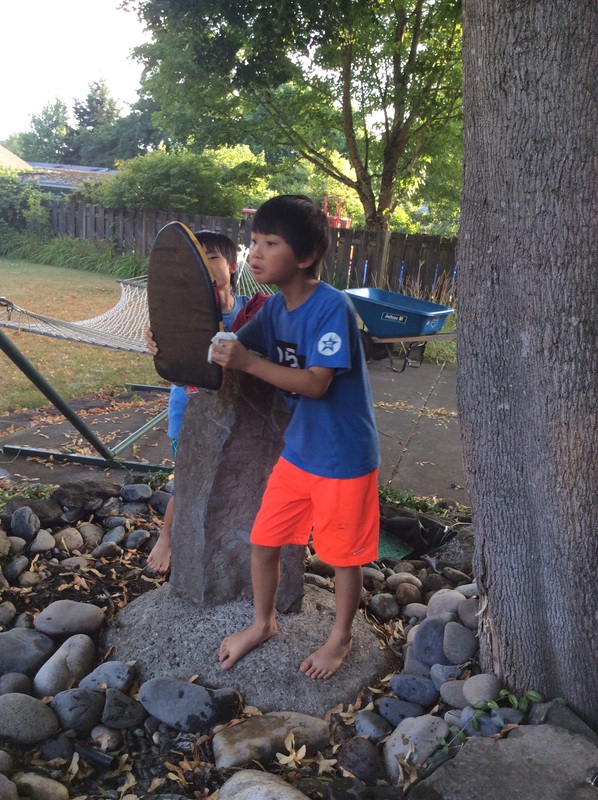 Everything about wood chopping. How to stack, how to chop – and all the possible variations of both. Wood deliveries, wood tool, music with chopped wood, contents on wood stacking, how to cut a piece of wood so that it is a burner for tea and a stool. The apparently bitter controversy over bark up or bark down in the wood pile. It was both tedious and mesmerizing. And all in Norwegian and subtitles! We had it on for hours, and yes, I’m aware of how crazy that sounds. Another highlight was the tour of Seattle Leslie’s fiber stash. It is impressive! Walls of IKEA bins full of spinning fiber, and more cases and boxes and bins of the yarn she has gathered since the days when she worked at a yarn store and was paid in yarn. We treated it with the respect normally given to museum visits. We ate, and drank gallons of tea, and laughed, and got so much done. I finished my embroidered undersea scene that I started in a class I took a couple of years ago. I also got the last four oz. of my Ashland Bay merino spun and plied both bobbins into finished skeins just needing their bath. My Volt wrap is just two rows away from needing the attached i-cord edging, and my blue sweater has its last sleeve attached. Just needs a zipper now. That blanket at the bottom was a major team effort and is going to get a blog post all of its own very soon. We are already planning the next get together. There is talk of an AirBnB in Olympia in the new year. Can’t wait! I’m revisiting my WIP list from early June to keep myself on track. A lot of frogging has greatly reduced this list. Red sweater – my oldest WIP, knit years ago, it just needs a crocheted edging and buttons, but will it even fit now? Octopus – finished and given to Haley! 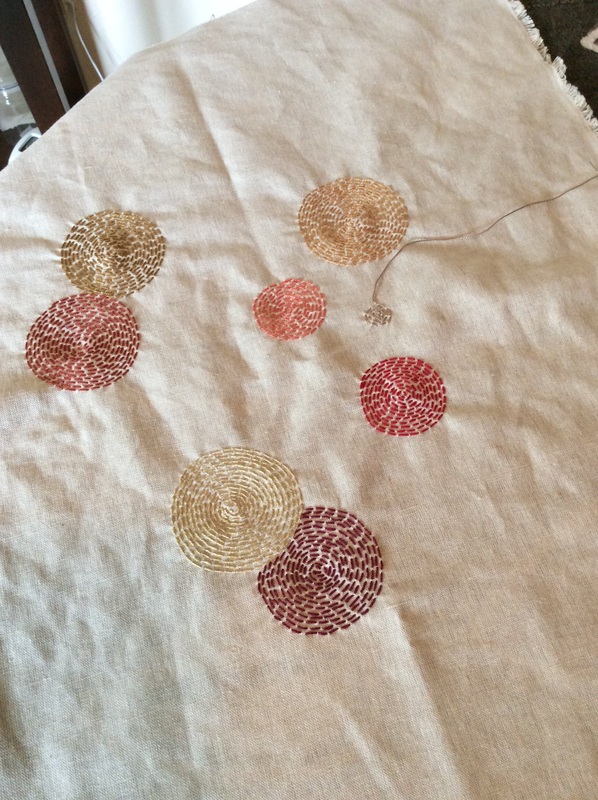 Mountains and flowers – I don’t love it, but it is also very close to done, so just do it already! 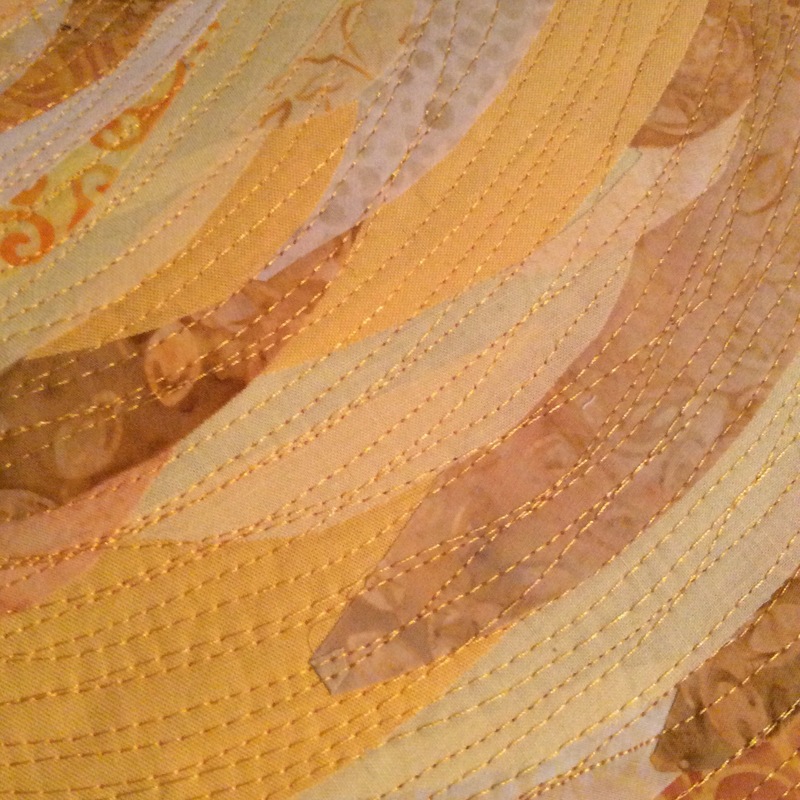 Most of my progress was destruction rather than construction and in the knitting part of the list, but there has been some progress on the quilting front as well. A good start considering it was the busy end of the school year (checked in 8000+ textbooks!) and we went on a week long coastal vacation. 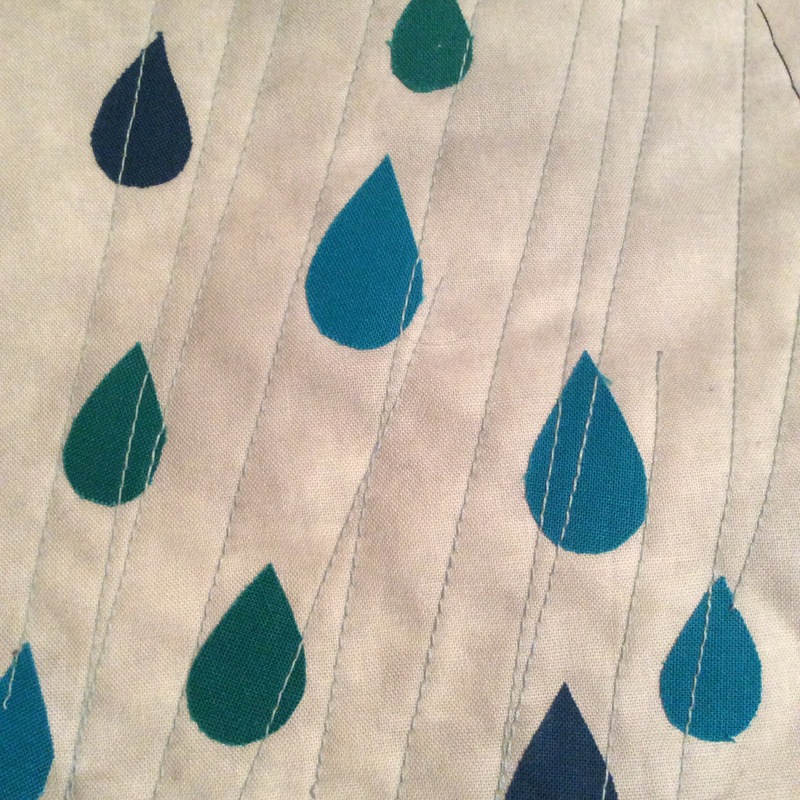 July is the start of the kitchen remodel, but I still hope to achieve more on the sewing front. I’ve always liked the word plethora – the sound of it – but in this case, a plethora of unfinished projects is way too much to keep warehoused. Projects must be finished at a much higher rate! 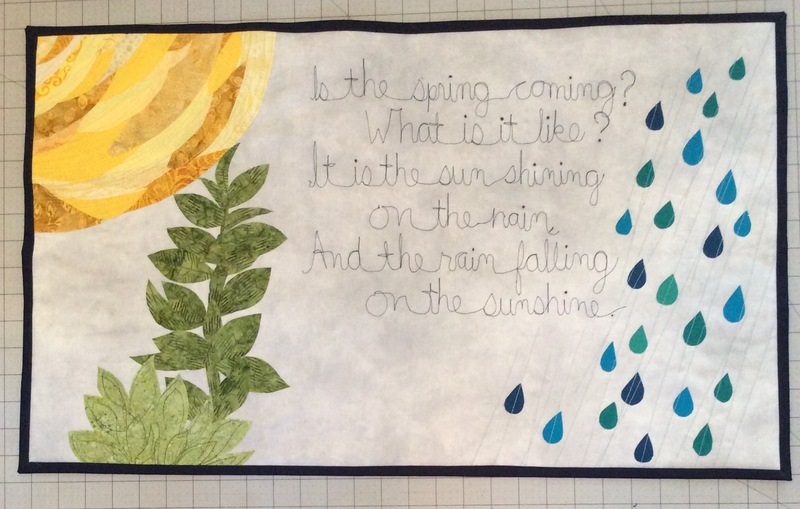 Back in March I made a list of quilting WIPs, but today I went rummaging and created a much longer one for all my crafts. There can be only one conclusion – I have too many fiber hobbies. 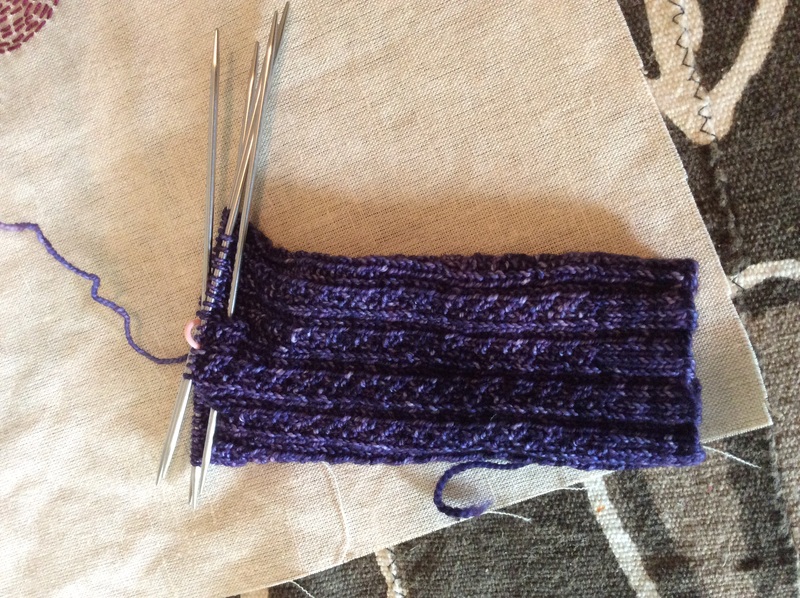 A lot of this project list can be disposed of quickly as it just requires doing away with the projects – many I stopped knitting because they weren’t working out, but they are still hanging around. 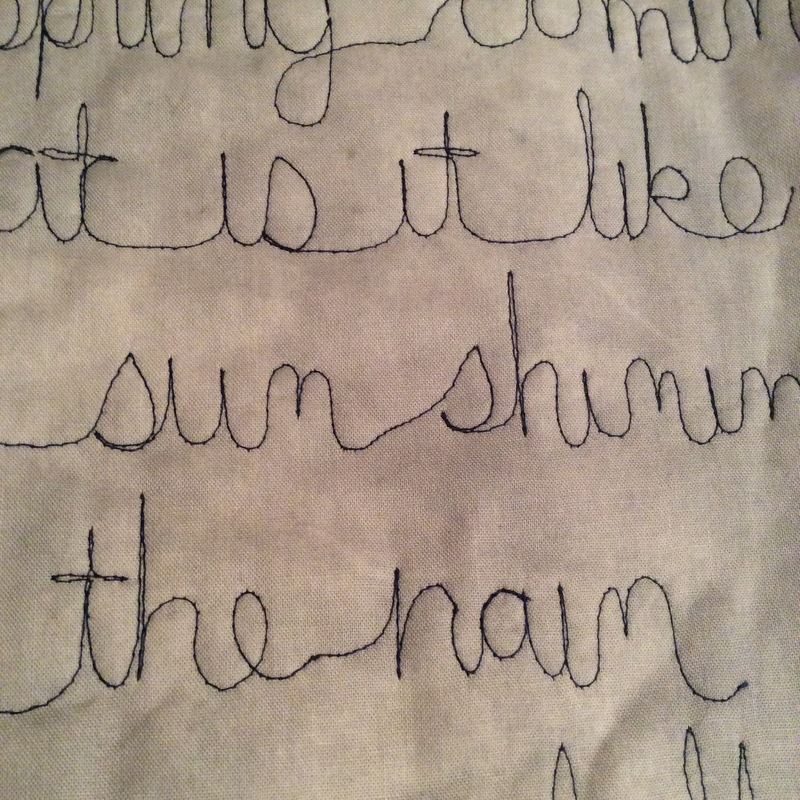 This project list is thankfully short – just one project started, a rug that I’ve partially warped for recently. It will be very quick once I start weaving. The last time I checked my Excel chart, I had just under 27 lbs. of fiber to spin. The mere fact that I need an Excel chart shows how out of control this hobby is! I’m sure there are more that I’ve missed, so this list may grow before it shrinks, but I am vowing here and now that it will shrink! My goal for the summer is to halve it at least. And this public posting, with updates, is going to keep me motivated and honest. I can’t remember what combination of blog links led me to this post on the TomofHolland site about a visible mending project, but I liked the ideas behind it, and the visual effect, and put it in my mental try-this-someday file. Enter my charcoal cardigan and a small hole in its front. I looked up some mending techniques, as my experience with repairs has been solely machine based before this. I followed the directions found here, that I had saved to Pinterest a while back. I rather like the scattered seed stitch effect, but I’m not sure I like the appearance of the mend on the sweater, it looks a little like I spilled something on my stomach. If there were more holes, more mended areas, it would look better. But I’m not going to chop more holes, so I think this is coming out, and I’ll mend it again with a charcoal thread. But I’m going to keep the concept in mind for the future. A bit of progress, in-between setting the lawn on fire with firework sparks and trips back and forth between my mom’s and IKEA to furnish her new condo’s extra spaces. But mostly it has been making sure that the kids weren’t setting themselves on fire. I hope everyone had a safe and sane 4th! 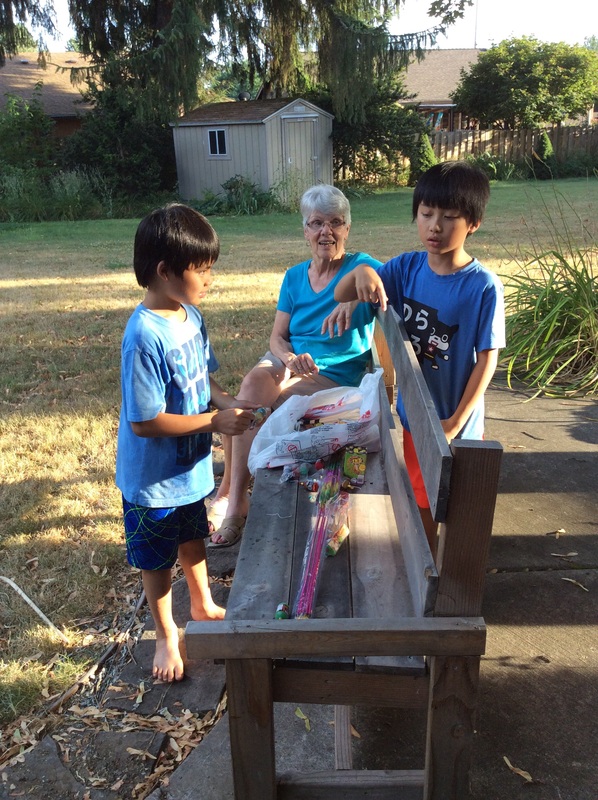 Grandma helped decide which one should blow up next. They seemed to think hiding behind a swim board would keep them safe. 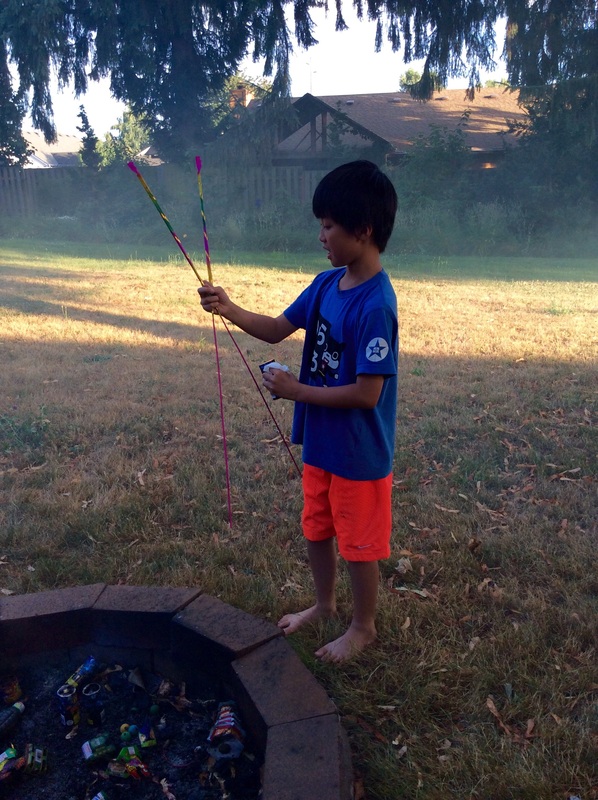 We all agree that giant sparklers sounded like a good idea, but we like the traditional ones better. We came back to Oregon just in time for a major heat wave! It is supposed to be in the low 100s today and has been in the 90s for several days. And the ten day forecast shows the same level of temps for the foreseeable future! In a house without air conditioning, this is not fun. I’m used to maybe a week or two of weather this hot in August, so we are not enjoying it. Wilting children are lying about moaning, and the parents and grandparent aren’t much better. How do people on the eastern part of the state cope with this so regularly?! My post trip plans were all about quilting, but the sewing room is upstairs, which is a good 20 degrees warmer than the basement. So I’ve done a little sewing in the morning before things get too warm, and then abandon the machine for more portable projects. 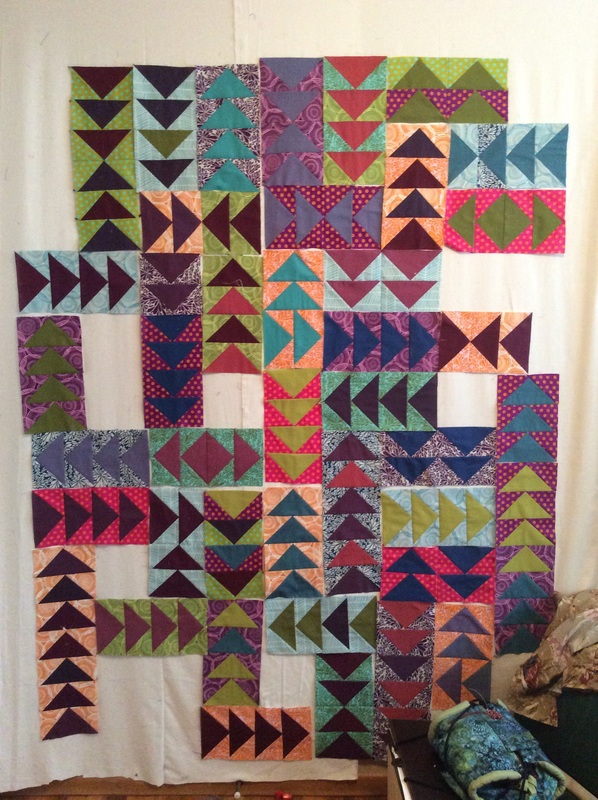 I finished assembling the blocks for the Scrapitude quilt and got the narrow and widest of the borders on. There will be one more medium width dark blue one to finish off the top, but that will have to be done on another cooler morning. A lot more ironing needed as well, but that additional heat was what drove me out of the room. 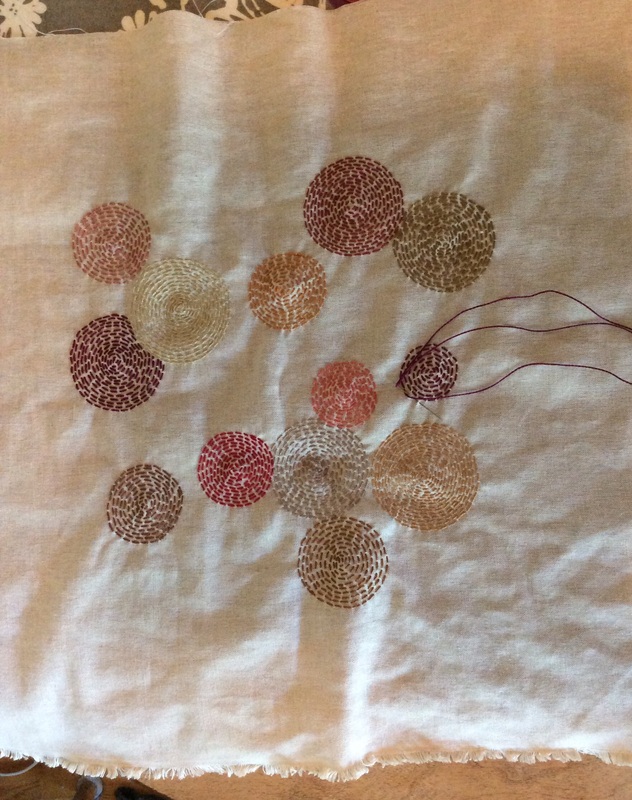 I’ve also added a few circles to my second running stitch pillow cover, and I’m making some progress on the Hedgerow sock that I had for plane knitting on the trip. 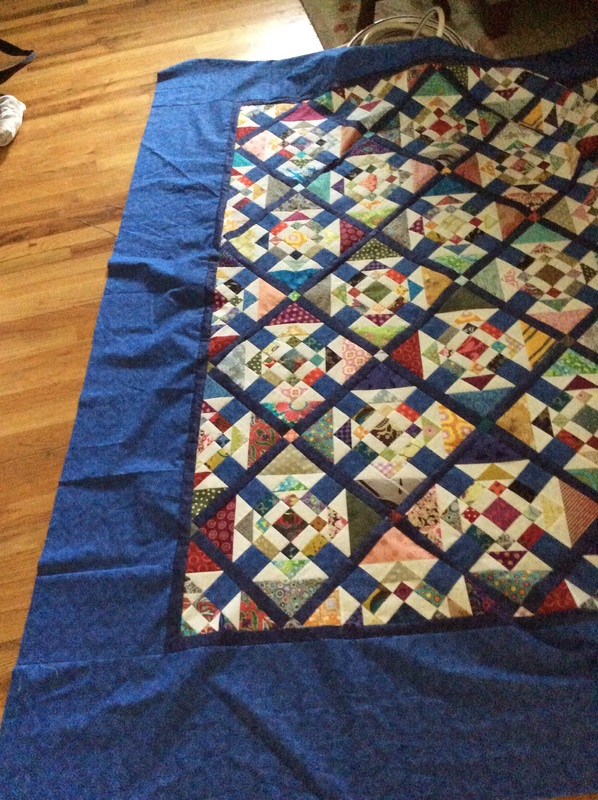 But I’m frustrated because I want to be finishing quilts!